Tracy L. McCarty obituary. Carnes Funeral Home. Tracy Leigh McCarty, 57, went to be with the Lord on March 2, 2016. Her final wish was to come home, under the care of hospice. We are thankful that we could honor her request. She died peacefully, surrounded by her loved ones, just as she wanted. Tracy was born on September 18, 1959, in Houston, Texas, as the daughter of John and Francine Allen. Tracy married her dear husband, Kim, on February 26, 1982. During their 34-year marriage, they shared three loving children. Tracy enjoyed many activities. She was very involved in her church family, loved playing cards or dominos, fishing, and socializing…but mostly, she adored spending time with Kim. Tracy and Kim celebrated their 34th anniversary in February, and were the loves of each other’s lives, best friends, and partners in every aspect. She will be dearly missed by everyone who knew her. Amongst her many passions in life, her children and grandchildren, were top of the list. Tracy was a wonderful mom and granny. She took every opportunity to share photos, stories, or tell her family how proud she was of them. She often said “I have the best daughter, son, husband, and grandchildren in the world”. We are all better people for having known her, and for being loved by such a wonderful lady. Her daughter, Brandi Rushing, precedes her in death. 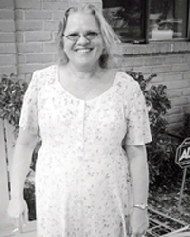 She is survived by her husband, Kim D. McCarty; son, Jeremy Robbins; daughter, Jennifer Burks (Joshua Burks); sisters, Glenda Allen, Cheryl Kuhn (Carl Kuhn), Ursula Simmons (Greg Simmons); nephews, John, Robert, Gordon and William; grandchildren, Deserie Rushing, Connor Rushing and Hogan Burks; Kim’s family, Blanche McCarty, Terry and Gene McCarty, as well as many aunts, uncles and cousins. Services have been held for Tracy.